This weekend we have seen at least one case of lousy parking in the town centre. Ludlow Town Council wants to solve this by banning daytime parking anywhere in the market and castle area. This will be on top of a hike in on-street charges to £1.60 an hour and conversion of Castle Street car park to long stay. The 15-minute free pop and shop will be cut to five minutes. The combined effect will make our town centre a lot tidier. We need to be careful it doesn’t make it a lot deader. Ludlow is short of car parking spaces. But bad parking in our town is not always caused by a shortage of spaces. It is a result of too many people being reluctant to walk more than a short distance or pay a parking fee. This can be a nuisance, unsightly and sometimes dangerous. The council’s solution is to make the market area a total no parking zone except for deliveries, buses and loading. The council is being asked to restrict parking from 7am to 6.30pm (LTC council paper). Will this stop situations such as that we experienced on Saturday? 11.11am Saturday 20 October. The driver had left the car in a no waiting zone overnight. I doubt it. This is an enforcement issue and people who want to break rules will break rules. It worries me that we are introducing a suite of parking changes almost simultaneously. Next month, on-street car parking in the town centre will rise to £1.60 an hour. Castle Street will be £1 an hour with no restriction on length of stay. The free pop and shop scheme will all but end. Shropshire Council thinks its measures will benefit our town and promote its economy. I am not convinced. It will take a year to see the impact of the charges. That is why I negotiated a review of the impact in November 2019. I think it would be unwise to introduce additional changes before then. 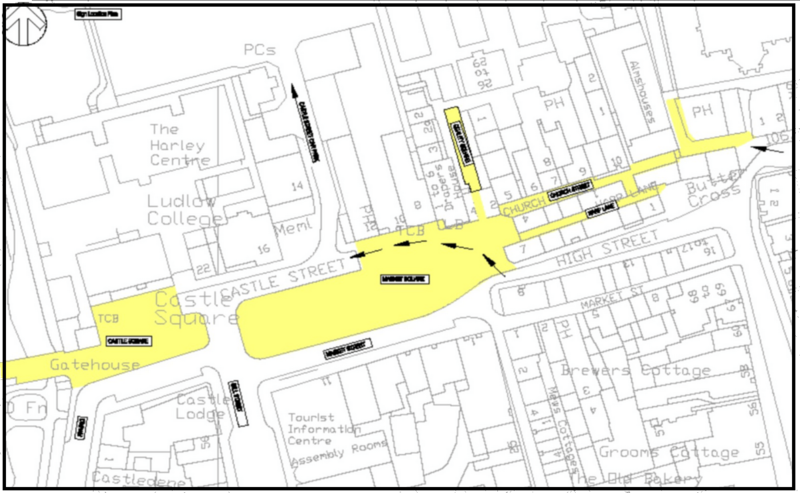 The council has had some success in restricting traffic in the market area with cones. It could improve on this with custom no parking signs. It could use planters to restrict access – improving the look of the market area at the same time. These inexpensive soft measures should be trialled while the new Shropshire Council parking regime beds down and is assessed. This should be sorted out before the market area restrictions come in. At the same time, we need to sort bus parking at the top of Mill Street. Ludlow Assembly Rooms wants the 701 stop to move onto Mill Street to prevent buses blocking views of the refurbished frontage. If the town council approves the plan tomorrow night – and I expect it to do so – it is not a final decision. The proposed scheme requires a traffic regulation order and that cannot be put in place without a further consultation by Shropshire Council. The unitary council has not yet agreed a budget for the scheme which will involve removal of yellow lines and new signage. The council’s highways budget is facing £10 million cuts to the highways budget over two years. All this points to this scheme being some way from implementation. Before then, Ludlow Town Council should use a some of its own money to implement soft measures to discourage bad and abusive parking over next summer.
. We have put forward proposals to increase the capacity of the Upper Galdeford car park by at least 20 spaces by reorganising the parking bays. Smithfield car park could be expanded into the Youth Centre car park at weekends. Extra spaces can be created on-street by marking parking bays. Regulations state that marked bays, which are 4.6m in length, cannot be used in pay and display area such as Corve Street but would be suitable for Old Street and Lower Galdeford.
. I have reported this vehicle to Shropshire Council. It is ironic that its Civil Enforcement Officers recently slapped a ticket on a bus in Ludlow town centre but were not around to witness this event. Parking enforcement loses £10 a ticket in Shropshire. Parking money mostly goes to buses. Did you know that? Are you surprised by this headline? I certainly am. In 2017/18, Shropshire Council took nearly £640,000 from Ludlow’s car parks and on-street parking machines. That’s three per cent down on the year before, probably due to bad weather over the winter. The ‘profit’ after operating costs was £373,000. Most of the profit is spent on subsidising buses. And, in what may come as a surprise to many people, those hated yellow screen stickers lose money. A loss of around £10 a ticket across Shropshire. The surface has been made good with temporary repairs and the car parking area has fully reopened. Now we need a long term plan for maintenance of this site.